Microsoft's new update for Windows Phone 8 added support for larger phones and higher-resolution screens, a move analysts hoped would soon put the operating system onto small-sized tablets, a market Microsoft and its OEM partners have largely ignored. Early Monday, Microsoft announced that Windows Phone 8 Update 3 -- like many from Redmond, a mouthful -- would roll out to current customers in the next several months. While Update 3 included several additions and enhancements, the one Microsoft chose to tout first was support for larger-sized Windows smartphones. "The update paves the way for future Windows Phone devices with 5- and 6-inch touch screens," said Darren Laybourn, who leads the Windows Phone engineering team, in a blog post. Update 3 also supports 1080p displays with resolutions of 1920 x 1080 pixels, nearly a doubling of the current resolution of 1280 x 720 pixels. Microsoft's update to Windows Phone came just a week before an Oct. 22 event slated by Nokia, where it's expected to unveil the new 6-in. Lumia 1520 -- a so-called "phablet" -- sporting a 1920-x-1080-pixel screen, the first for a Windows Phone device. But while analysts acknowledged that Microsoft may gain some ground in smartphones by moving into the phablet market -- which currently accounts for about 20% of the total, and is particularly hot in China, South Korea and other Asian countries -- they saw more potential if Microsoft took a next step. "Going to a bigger screen is important, not only for phablets ... but also because it paves the way to eliminate one of the stumbling blocks Microsoft has had in trying to impact the low end of the tablets market," said Jack Gold, analyst with J. Gold Associates. That barrier, said Gold in an email interview Monday, was Windows 8, which he contended wasn't suitable for smaller -- and less expensive -- tablets. "Windows Phone on a 'lite' tablet could compete with Android better than full Windows 8 because it is 'lighter' on resources and could be implemented at lower overall cost ... with a less costly bill of materials," Gold said. Ben Bajarin of Creative Strategies agreed. "If Microsoft wants to be serious about the 'slate' market ... tablets smaller than 8-in. ... they need to use Windows Phone for that product," said Bajarin. "That would start to take [Windows] towards a more consumption-style tablet." Like Gold, Bajarin felt Windows 8 wasn't Microsoft's best option for smaller tablets, but Windows Phone was. "The use cases are completely different," he said of the two size categories, smaller and larger, with the former almost exclusively used to consume content, such as reading books and email, watching videos, viewing photographs. Only in larger sizes are tablets used for productivity tasks or creation content. "I've always thought that Microsoft should have used Windows Phone for smaller tablets," said Bajarin, citing "touch targets," the area of a screen that responds to a tap. "Touch targets should be different for touch-based devices 4-in., 5-in., 7-in. and 10-in.," he said. "It really takes smart and savvy developers to design appropriately-sized touch targets." Bajarin's argument was that developers of Windows Phone apps have more experience designing apps with touch targets appropriate for smaller screens than those who create apps for the larger screens used by Windows 8 and its sibling, Windows RT. That led him to another point: Microsoft has an opportunity to excite Windows Phone app developers by pushing the OS onto smaller-sized tablets. "Microsoft needs a [range] of very specific devices that lets [Windows Phone] app developers take advantage of something more than a small screen," said Bajarin, applauding the move by Update 3 onto larger displays. Microsoft regularly gets dinged for the small size of its app ecosystem on Windows Phone and Windows 8 when compared to the much larger inventories on Android and iOS. "It's not necessary that [Microsoft] have all the same apps, but what is is that developers take advantage of their platform in unique ways. If developers can do that, it offsets the negative," Bajarin added. Engaging the developer base to make new apps, ones unique to Windows Phone, is one of Microsoft's challenges, Bajarin acknowledged. But he gave the company a better chance if it offered Windows Phone developers something to do besides create for screens 6-in. and smaller. Not everyone thought like Gold and Bajarin. "This will open the door for phablets and you can expect to see some announced very soon," said Ryan Reith of IDC in an email interview Monday. 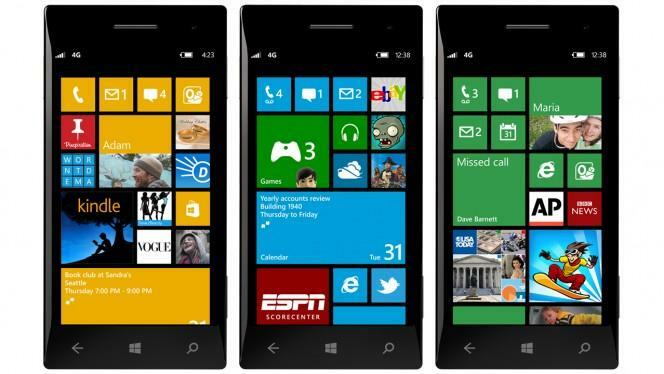 "Nokia is the obvious choice here as they are clearly the front runner pushing Windows Phone 8 forward. Technically, it could also now support 7-in. or greater but that isn't the strategy here." Instead, said Reith, Microsoft will stick with its current -- and long-expressed -- strategy of dedicating Windows 8 and Windows RT, and their 8.1 successors, as the operating systems for tablets. "We expect this to remain as is," said Reith. "Windows Phone and Windows will have to continue to show increased synergy in 2014 if they truly want to compete across all computing mediums." So far, Microsoft has followed that strategy: It hasn't announced a smaller Surface tablet of its own -- although rumors that it will next year continue to accumulate -- and the few tablets of that size released by OEMs have been built around Windows 8, not Windows RT, as some had once expected. At the moment, in fact, Microsoft is the sole OEM using Windows RT. Dell, the last partner with a Windows RT tablet in its portfolio, said two weeks ago that it had no plan to refresh that line. Reith stuck to his guns even though several long-time Windows watchers, including blogger Paul Thurrott, citing anonymous sources, have claimed that the next iteration of Windows Phone, code-named "Blue," likely officially dubbed Windows 8.1, and due out next year, will support screens up to 10-in. In the shorter term, said Reith, Update 3 will give Microsoft the chance to continue growing its share of the smartphone OS market. "I am not sure Update 3 will have any consumer effect other than [as] the gateway to bringing 5-in., and possibly larger, Windows Phone 8 smartphones to market. This is the overlying consumer buying trend so in that sense it will have a positive effect." According to IDC, Windows Phone powered 3.7% of the smartphones shipped in the second quarter, the most recent for which the research firm has released estimates. That was up from 3.1% in the same period the year prior. "The smartphone market might be an Android and iOS race when it comes to market share but we have made it clear that we consider Windows Phone 8 the third platform and expect it to grow in the coming years," Reith said. "Not surpassing Android or iOS, but continuing to grow."